Our second week of the project ends today. 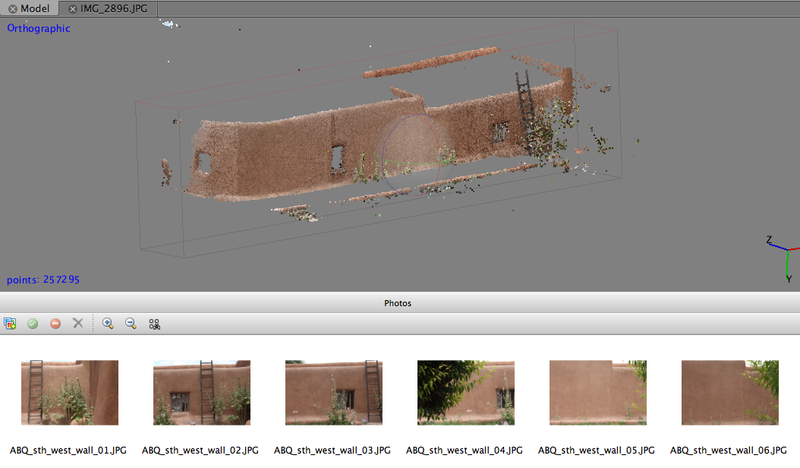 On Monday the project team traveled back to O’Keeffe’s home in Abiquiu for photogrammetry capture. 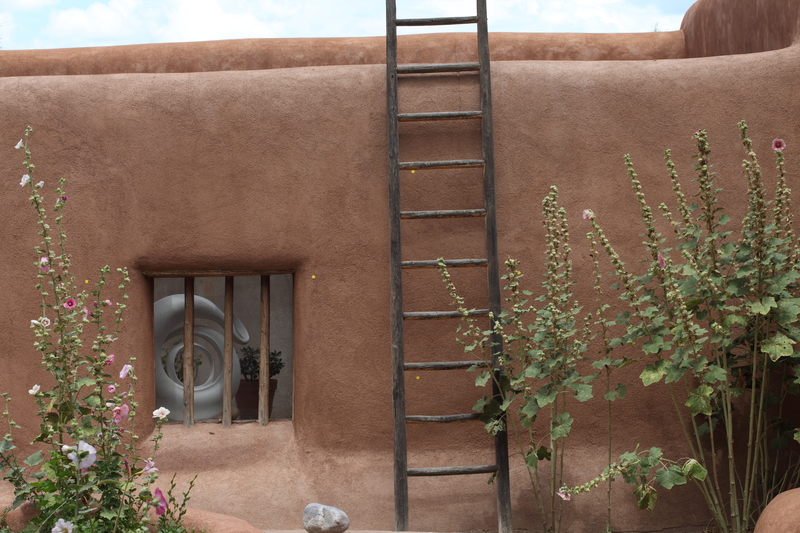 Dale wanted to capture a section of the exterior adobe wall. It was mid-day and the wall he originally wanted to capture was facing a garden with large bushes and a tree. The tree was casting too many shadows on the wall and there was a slight breeze. The team did not know how this would affect image processing within PhotoScan so we moved to an alternative wall without any direct shadows laying upon it (besides some plants and a ladder). There was also a large, recently watered garden between the camera and the wall so a 100mm lens was needed. The team positioned the camera 42ft away from the wall so that it would be fully within the frame. Ideally the camera would have been closer to the wall, but certain obstacles, such as the moist soil, forced us further back than we would have liked. To keep the front two legs of the tripod at a constant 42ft from the wall, a chalk line was used as a guide. This enabled the team to maneuver the camera horizontally and still keep accurate distance from the wall. Along our horizontal line, a large bush sat within our line of sight. To fix this problem, we shot at a 15 degree angle outside of the bush to capture the wall the bush was blocking; PhotoScan had no problem putting the 3D image together. Maneuvering the shot around the bush. After all the images were captured horizontally, 90 degrees and 270 degrees they were ready to be processed in PhotoScan. Much of the detail was lost, probably from being too far from the wall, but the mesh was mostly clear. Some of the areas where we had plants against the wall are distorted. 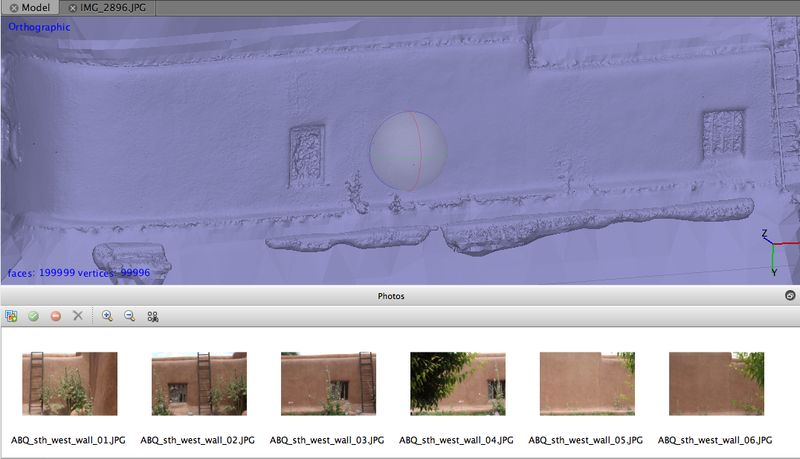 Results in the point cloud view mode. Results in the solid view mode. Throughout the week we completed additional RTI’s of three paintings “Easter Sunrise”, “Pedernal”, and “Mesa and Road East” The continuous practice of RTI makes the process faster and smoother.